Commissioner Sid Miller said this week that he will alter state agricultural rules to allow the use of a pesticide called Kaput Feral Hog Lure. The product is essentially bait food laced with warfarin, which is used as a blood thinner but has proven lethal to hogs. "This is going to be the hog apocalypse, if you like. If you want them gone, this will get them gone," Miller said Monday. Hunters already are allowed to kill the animals from land or air; Miller as a state senator wrote legislation that allowed for the aerial killing of hogs. Researchers at one time were working to slow their rapid reproduction with a birth control pill. The animal has long been seen by farmers as a nuisance that shreds fields and pastures. With some hogs reaching 400 pounds, they can root deep into a pasture causing craters that some farmers have compared to a mine blast. Texas has half the nation's feral hogs, but they're now found in nearly 40 other states, up from fewer than 20 states in the 1990s. Descended from domesticated pigs who escaped, the hairy-backed hogs are found in nearly all of Texas' 254 counties. They can produce three litters in two years, the piglets can reproduce six months after birth, and the animals have no natural predators. Their explosive numbers and the ruin they can bring to land -- it's estimated they do some $50 million in damage to Texas crops and property each year -- have spawned dark humor among farmers and others. For instance, it's said that when a feral hog has six piglets, only eight are expected to survive. If a hog is ever killed, the next day 15 come to the funeral. Miller says the Kaput Feral Hog Lure will pose only a minimal risk if consumed by other animals because much higher dosages are needed to affect other wildlife or livestock. Hunters will know if a hog consumed the pesticide because its fat will turn blue. But some groups such as the Texas Hog Hunters Association criticize Miller's action because hunters may be less likely to target feral hogs knowing there may be poison in their systems, the Houston Chronicle reported. 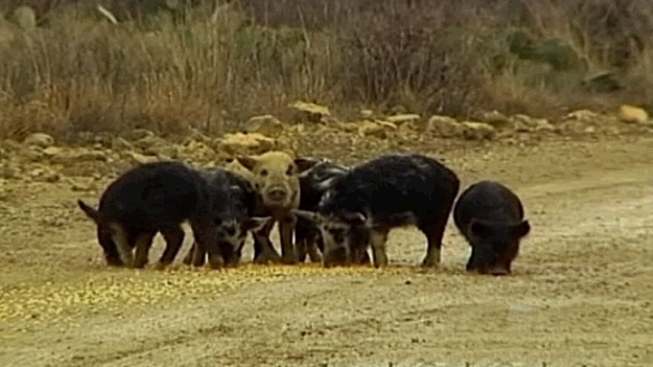 Some Texas cities and counties are taking different approaches to culling hog herds. Dallas officials this week approved hiring a contractor who will trap and remove the animals and then take them to a slaughterhouse. Caldwell and Hays counties have offered a bounty of $5 a head to hunters, the Austin American-Statesman has reported.